Vegan Eats and Treats! 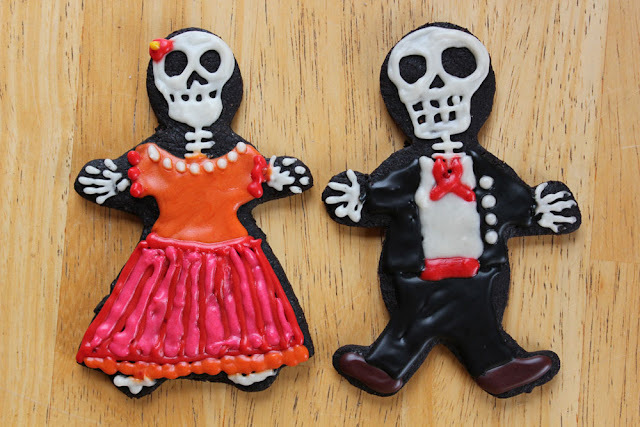 : MoFo 31: Dia De Los Muertos Cookies!!! MoFo 31: Dia De Los Muertos Cookies!!! It's the very last day of MoFo 2012, it's Halloween, and it's the day before Dia De Los Muertos! So much to celebrate ~ all in one fell swoop! Today I teach two classes, one in the morning ~ and one tonight. I don't know how many people actually want to spend Halloween evening at yoga class (they said they'd be there!! ), but I promised them special cookies if they came. I found a recipe for Brownie Roll Out Cookies in my local bookstore's seasonal newsletter. I veganized it - and added some cayenne & cinnamon to make it more Mexi! I also used my super black cocoa powder for a darker, more spooky effect. This is actually my Easter Egg cookie cutter, turned upside down and repurposed as a skull cookie cutter. Mwahahaha! 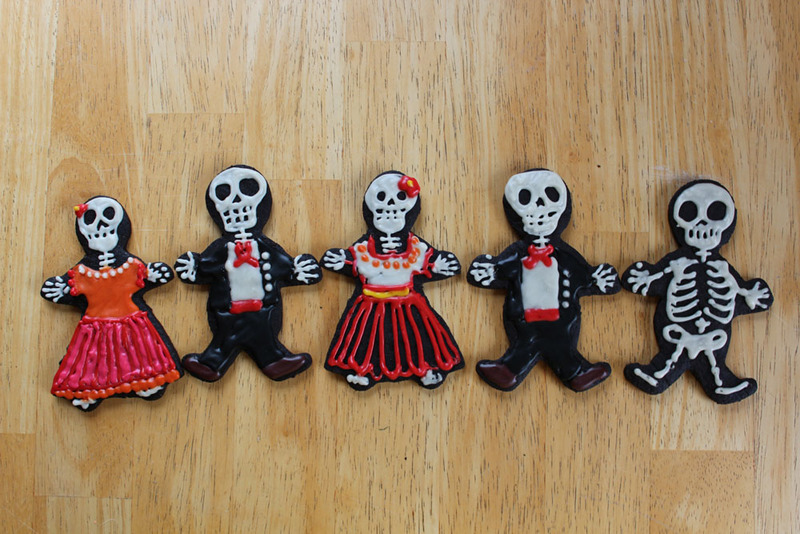 My original plan was to make a whole bunch of the Dia de Los Muertos figurine cookies... but this cookie dough was a bit dry and hard to work with. Every time I lifted up the cookie cutter, the little guys would get their arms or head ripped off. After just a few, I gave up and decided to stick with Sugar Skull Cookies. Nonetheless - I did manage to make a few of these guys... I love the fancy Mexican dresses and I especially love the mariachi suits!! Aren't they a dashing couple?? I'm going to save two for us and two for my parents... we always celebrate Halloween together with my parents - so I'll see them tonight. As you can see I made tons of different frosting colors. 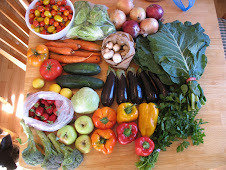 I made a big batch of white first, and all sorts of little supplemental batches. 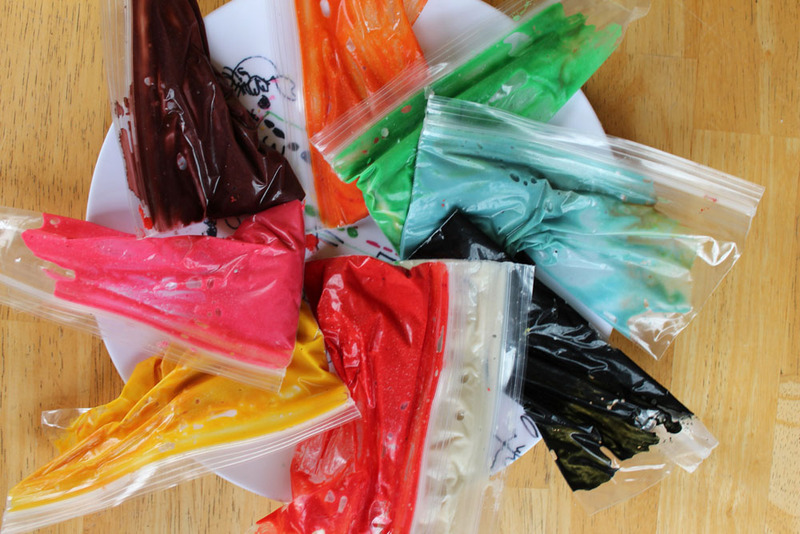 You probably already know this trick - it really works great - about using ziplock baggies as frosting squeezers? I just put the frosting in, zip it shut (make sure it's really zipped shut!! ), then cut a tiny tip off one corner. The more you cut off, the thicker your line will be be, so start small. Hee hee, I also really love this guy. He's just so cute. 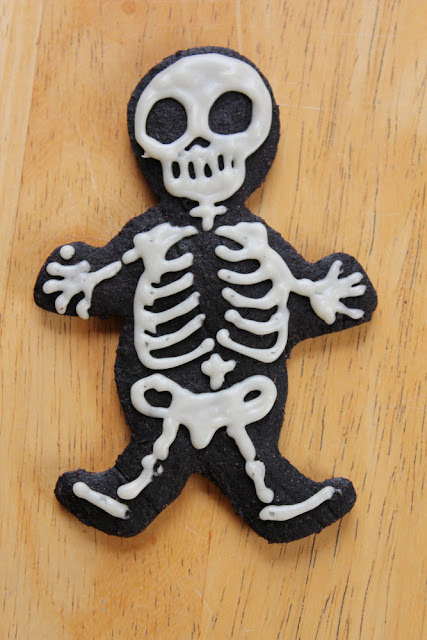 I'll have to make more skeleton cookies soon. They are really fun. I drew all of us in our imaginary Halloween costumes! Dottie is going as Big Bird. She is so goofy, we always think that we should have named her Big Bird. Snoopy is going as Cupid, because he's Cute and stUPID. :) ha ha. Stevie Wonder is going as a love bug, because she is a love bug. I don't really know what I am... a person with chipmunk ears holding a Jack O Lantern! Bon Voyage to another fantastic MoFo Season! Thanks for reading my blog!!! I had a really great time mofoing this year. Now I just gotta go catch up on all my favorite new blogs! i am dying. i am dead. these are the mostest amazing. I LOVE THEM - you are a total rock star! Now that's going out with a bang (out of Mofo, that is)! Your yoga class is very lucky. I'd turn up for those cookies! 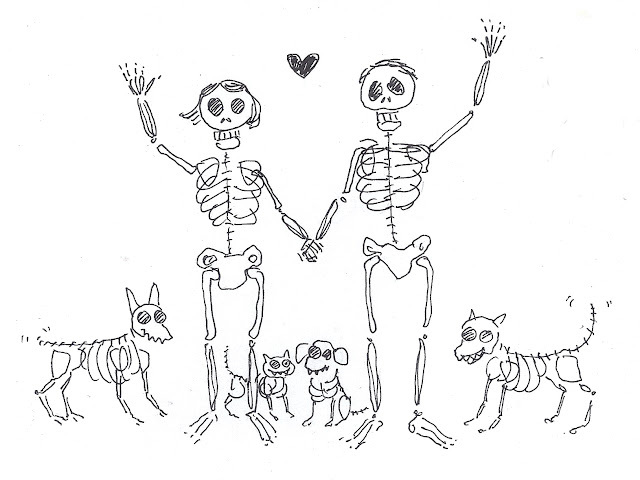 that skeleton is cute beyond all cuteness! The cookies are fabulously gorgeous — I don't think I've ever seen such great cookie decoration. The figures are especially fetching. I love these so much! I was thinking about making some skeleton cookies tonight but I don't know if they can compete with these! OMG these are the most amazing things I have ever seen and proms my favorite halloween post today!! 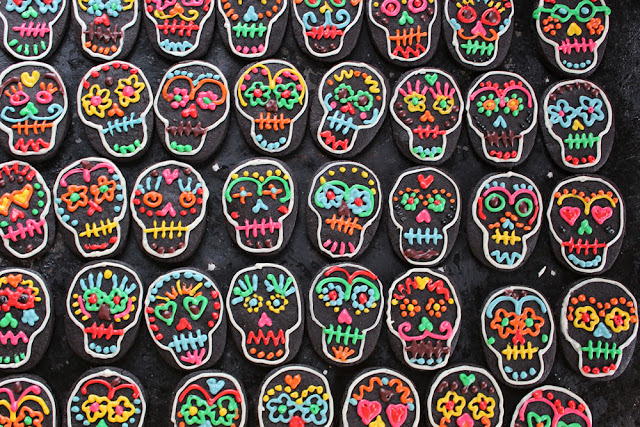 i am obsessed with dia de los muertos! (also because the second day of it is on my birthday, how ironic!). really though, i love the colors and the meaning behind it. and these cookies are so amazing! you did a fantastic job! yum! The cookies look amazing - I love both of today's doodles!!! Oh Amey, I'm going to miss your MoFo fun. Amey, these are BLEEPING awesome! I love the Days of the Dead and between you and Kittee, my head is about to explode. Seriously, this is the BEST post. Wish I could have come to your yoga class. I need to get back to it. SHUT. YOUR. MOUTH. No, shut my mouth. But put one of these cookies in first. Those are amazing (Amey-mazing?) cookies. 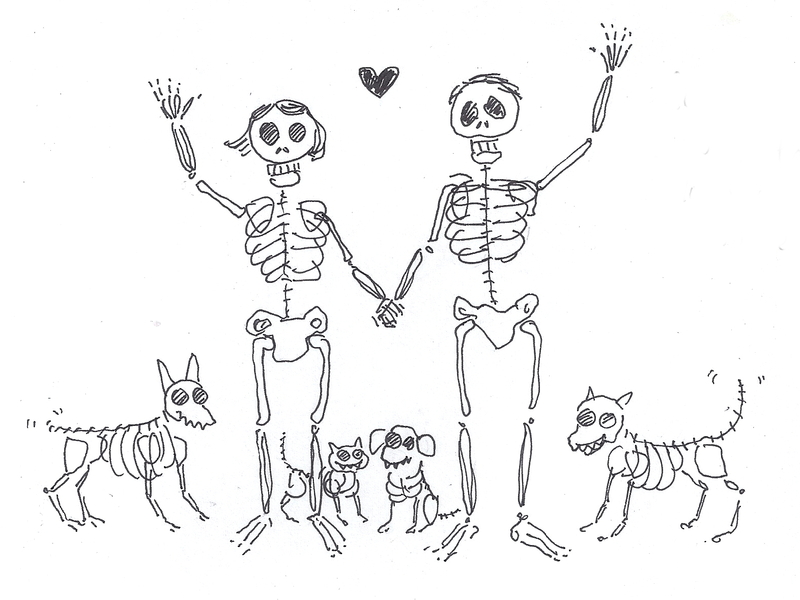 Also, I love the skeletons. Doodle always from now on! I would never want to eat these. I think they are so. beautiful!!! I would totally do yoga if I knew I would be receiving one of your cookies. Amazing job! You're so freakin' talented Amey! Wow, you're really seeing out this years MoFo with a bang! 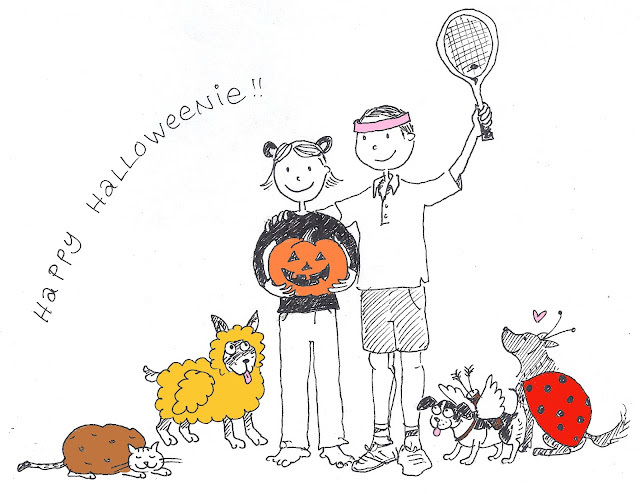 Your drawings in this post are amazing (such cute halloween outfits!) and I literally cannot handle how awesome the cookies are. I wish I had the skills to decorate things so beautifully! Whoa, these are seriously gorgeous! 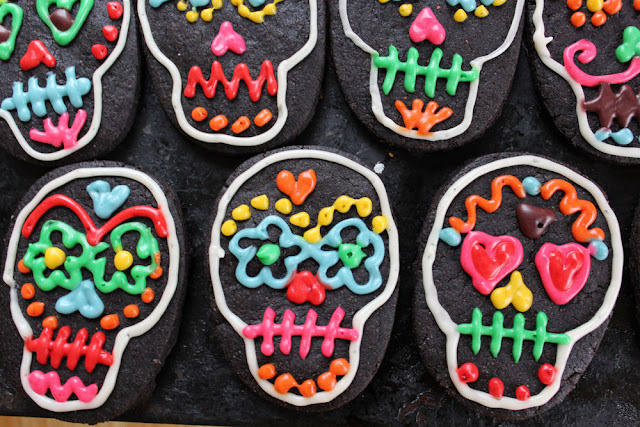 Your Dia de los muertos cookies were as delicious as they were beautiful! I am sure glad that I went to yoga that night. Thanks Amey! this has to be one of my most favourites posts ever. super pretty cookies can't wait to bake them!